The Sumo Performance in Autumn is a kigo for haiku. Nowadays Sumo tournaments are held six times a year.
. WKD : Ryōgoku Kokugikan 両国国技館 stadium for sumo . Towards the end of the Nara period, Emperor Shoumu established the Sumai-no-Sechi (literally “Sumo Event”) as one part of the “Sando-sechi (Tripartite Events)” of his imperial court. During the Heian period the Sumai-no-Sechi was an event with pomp and splendor as part of the Tanabata (Star Festival) attended by the Emperor. This takes place in the Kokugikan 国技館　Sumo hall in Tokyo. 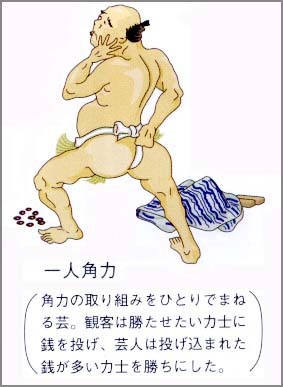 nakizumoo 泣角力 "sumo with tears"
This "tearful match" is also performed at other shrines and other times. While the grown-up sumo wrestlers prepare for the upcoming grand sumo tournament in Tokyo (starting May 6), a somewhat younger field of competitors will face off in Hiroshima. Dressed in colorful kimono, the contestants will compete in speed and stamina in the noble sport of crying. The event is called naki-zumo, which translates as the "crying baby sumo," and the rules are simple: Two toddlers are placed on pillows facing each other. A sumo referee will then start to taunt the babies, trying to persuade them to shed tears by ordering them to "nake, nake" ("cry, cry"). If this doesn't do the job, the referee will pull out his devil mask and try to give the kids a fright. The winner is the toddler who cries the longest and hardest. The competition, a Japanese tradition dating back 400 years, is inspired by the Japanese proverb, "naku ko wa sodatsu" (loosely translated as "crying babies grow fast" in English). While parents may think the screams of a child are shortening their own lives, the intention of this tournament is to encourage the healthy growth of the babies. Another aim of the tradition is to scare away evil spirits. at Gokoku Shrine in Hiroshima on May 5, which is Children's Day in Japan. is a competitive contact sport where two wrestlers called rikishi face off in a circular area. The sport is popular in Japan and is surrounded by ceremony and ritual. The Japanese consider sumo a gendai budō: a modern Japanese martial art, even though the sport has a history spanning many centuries. The sumo tradition is very ancient, and even today the sport includes many ritual elements, such as the use of salt for purification, from the days sumo was used in the Shinto religion. Sumo was mentioned in Nihon Shoki, one of the earliest texts in Japan, under its earlier name sumai, from the 8th century A.D. However, these early forms would not be sumo as it is known today, as in many cases the wrestling had relatively few rules and unarmed fights to the death were still referred to as "sumo". In addition to its use as a trial of strength in combat, it has also been associated with Shinto ritual, and even today certain shrines carry out forms of ritual dance where a human ceremonially wrestles with a kami (a Shinto divine spirit). It was an important ritual at the imperial court. Representatives of each province were ordered to attend the contest at the court and fought. They needed to pay for their travels themselves. The contest was known as sumai no sechie, or "sumai party." Over the rest of Japanese recorded history, sumo's popularity has changed according to the whims of its rulers and the need for its use as a training tool in periods of civil strife. The form of wrestling combat probably changed gradually into one where the main aim in victory was to throw one's opponent. The concept of pushing one's opponent out of a defined area came some time later. It is believed that a ring, defined by more than the area given to the wrestlers by spectators, came into being in the 16th century as a result of a tournament organized by the then-principal warlord in Japan, Oda Nobunaga. At this point wrestlers would wear loose loincloths, rather than the much stiffer mawashi of today. During the Edo period, wrestlers would wear a fringed kesho-mawashi during the bout, whereas today these are worn only during pre-tournament rituals. Most of the rest of the current forms within the sport developed in the early Edo period. Professional sumo (大相撲, ōzumō) can trace its roots back to the Edo Period in Japan as a form of sporting entertainment. The original wrestlers were probably samurai, often ronin, who needed to find an alternative form of income. Nations adjacent to Japan, sharing many cultural traditions, also feature styles of traditional wrestling that bear resemblance to sumo. Notable examples include Mongolian wrestling, Chinese Shuai jiao (摔角), and Korean Ssireum. 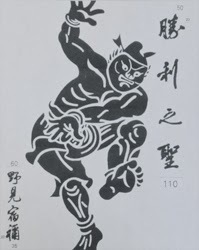 Examples of Chinese art from 220 BCE show the wrestlers stripped to the waist and their bodies pressed shoulder to shoulder. is also known as the birthplace of Kanjin-zumō (勧進相撲), founded in 1684 and origin of the current professional sumo. ... In 1900 (Meiji 33), the stone monument to commend successive yokozuna, the Yokozuna Stone (横綱力士碑, Yokozuna Rikishi-hi), was built by Jinmaku Kyūgorō, the 12th yokozuna. 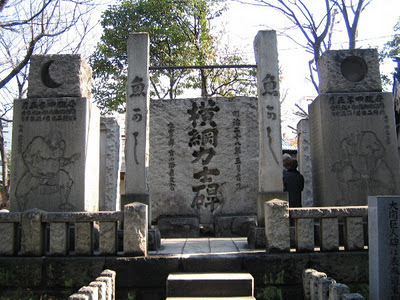 Now, the stone inscribed with the shikonas of all yokozuna until Hakuhō Shō, the 69th yokozuna, and "unrivaled rikishi" Raiden Tameemon. The shrine has many other stone muments related to sumo.
. Tomioka Hachimangu 富岡八幡宮 . Sumo wrestling is the national martial art of Japan, in which wrestlers compete for superiority in power and technique. It is said that Sumo Shrine is the place where sumo first began, and it is here, according to records, that Nomi no Sukune 野見宿禰 Nominosukune and Taima no kehaya 当麻蹴速 Taimanokehaya competed before the 11th Emperor, Suijin. The winner of the competition, Nominosukune, is enshrined in a small shrine in the sanctuary. We can still see the remains of the sumo ring where that competition took place. CLICK for more images !
. 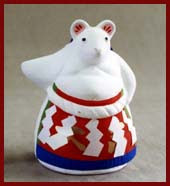 haniwa　埴輪 Haniwa clay figures - Introduction .
. Sumo　相撲 Sumo wrestling dolls . This is a figure of speach, indicating a hopeless situation. Oyamatsumi Jinja 大山祇神社 on the island of Omishima in the Seto inland sea. The performer has to make the audience laugh with his attics at pushing an invisible adversary and finally loosing the match with a loud fall on the ring. If the Deity wins, there will be a good harvest this year. It used to be performed at the "Rice Planting Festival" on the 5th day of the fifth lunar month and later at the 抜穂祭 "Rice Harvesting Festival" on the 9th day of the ninth lunar month.
. daidoogei 大道芸 Daidogei street performance in Edo . The street performers in Edo often made parodies of the bouts between famous rikishi. If they were skillful, passers-by would throw money at them. There was a Yokai monster called シバテング Shiba Tengu, who took the form of a young man and challenged people to a Sumo match. That person became bewitched and would do "hitorizumo" all night long. It was a kind of trick the Kappa 河童, who liked Sumo wrestling a lot, also played on humans.
. - Welcome to the Kappapedia ! . "Bad news travels a thousand miles."
. senryu, senryū 川柳　Senryu in Edo .
. Daidôzan Bungorô 大童山文五郎 Daidozan Bungoro . Absent of champion is problem in this Sumo Autumn season. Please come back Mongol sumo wrestler to Japan stage. A sumo wrestler. Shinji Ogawa paraphrases, "The woman allowed the sumo wrestler to rub her hand." Why? For good luck? Hundreds of babies in Japan are taking part in a sumo tournament. But they're not wrestling. All they have to do to win is not burst into tears. The Mikumano Shrine in Hanamaki City has held the tournament annually for more than 300 years as a way to pray for babies to grow up healthy. Shrine officials opened this year's event on Friday. Babies from six to 18 months old faced each other in a sumo-style ring. When one started crying, the other was declared the winner. Some babies lost their bouts by starting to cry before they were put in the ring. Others won by sleeping the whole time. One mother said she had been pregnant during the earthquake and tsunami last year so seeing her baby healthy and taking part in the tournament was an emotional experience. The tournament runs through Sunday. Written about 貞亨元年, Basho age 41 or older. Chichibu Dono refers to the samurai Hatakeyama Shigetada 畠山重忠 (1164 - 1205), who was a vassal of the famous Minamoto no Yoritomo 源頼朝 (1147 - 1199). In the history book "kokon chomonjuu" 古今著聞集 from the Kamakura Period there is a story that he once won against the strong sumo wrestler Nagai 長居. The circumstances why Basho picked him for his hokku is not quite clear. This early autumn hokku was written late in the 7th month (August) in 1818, when Issa was back in his hometown or traveling nearby. 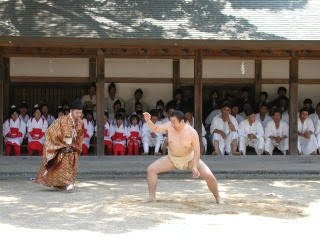 In August it is still hot in the daytime, and around sunset a group of young men arrive and begin an improvised sumo competition on a street corner. They probably range from mid-teen boys to young men in their twenties, and most have probably been working during the day. Perhaps they arrive suddenly because they want to make the best use of the remaining light after they finish their day's work, or perhaps it's because commercial street sumo was outlawed, and they want to perform quickly and then move on. They aren't professional wrestlers, however, so the authorities were probably rather lenient, especially in rural farming towns. In any case, they are amateur sumo wrestlers unattached to any master wrestler's "stable" or organization, and they simply show up all at once and begin a series of matches while passersby stop to watch. Though it's getting dark, they wrestle in the light of the moon, which is rising above a gate facing the street, and onlookers no doubt stand in a circle around them, some tossing coins to winning wrestlers they like. Issa stresses that even though these boys and young men look at first glance like rowdy street fighters rushing to join a brawl, they obviously have trained hard and show a lot of skill. Though unattached amateurs, they should be praised and are worthy of being called real sumo wrestlers. This hokku exists only in Issa's diary for 1821 in the copy made by his student Yamagishi Baijin. It is in a section that corresponds to the eighth lunar month (September) in the alternative copy of Issa's diary made by Kazama Shinzo. (Issa's own copy of his diary for this period has been lost.) The hokku has a headnote indicating it is about something Issa experienced at Funo Crossing, where in Issa's time a ferry crossed the Chikuma River in mountainous Shinano, not far from Issa's hometown. The Chikuma (also known as the Shinano River) is the biggest river in Japan and was difficult and sometimes dangerous to cross, but Issa often had to cross it. So did sumo wrestlers from Edo and elsewhere, who were regularly invited to wrestle during ceremonies held by local Buddhist temples and Shinto shrines to raise money for repairs and upkeep or for a new Buddha image or god-hall. In the hokku a sumo wrestler seems to be getting on a medium-sized, oared ferry boat, and his big body stirs up a breeze whenever he moves. Issa says he kindly causes an autumn wind to stir, so he feels thankful for feeling the breeze. It's autumn, and the river air is probably not hot, so Issa seems to be thanking wrestler less for coolness than for providing a bit of breeze that gives at least the feeling of being a following wind that will aid the boat in making its difficult crossing of the big river. In September the river is still rather full and the current rapid, and the presence of the wrestler seems to give comfort and assurance to Issa and other passengers. It's also possible to read the hokku literally: the wrestler gets on the boat just as a perceptible breeze is springing up, and the wrestler, who himself seems to be a force of nature, seems to be stirring up or bringing with him a favorable autumn wind that will help the ferry cross the river smoothly and easily. In the ancient period sumo seems to have been primarily a form of divination carried out to determine the will of a shamanic god in a certain situation, and even in Issa's time, shrine and temple sumo matches had a religious significance, so the wrestler may well seem to be a presence from somewhere just beyond normal human reality, and the conjunction of his appearance and the appearance of a breeze may seem uncanny to Issa. And, like the autumn wind, the wrestler constantly wanders here and there to perform, never staying in one place for long. Though Issa wasn't an athlete, the wrestler may seem like a fellow traveler who offers by his example encouragement to Issa in his own constant travels. Shinji Ogawa notes that ôsumô denotes "the major league, or professional sumo wrestling or wrestler(s)." He pictures the scene in this way: "Despite the excitement of sumo wrestling, the owl keeps sleeping. In Issa's day, sumo wrestling was a big event. Everybody in Edo was talking who beat whom and how the next day's matches would be. Issa, I think, wanted to show that there is the world unaffected by such human activities." 音羽山 Otowayama, 粂川 Kumegawa, 花籠 Hanakago, 片男波 Kataonami and 二子山 Futagoyama. There are many graves of famous Sumo wrestlers in the compound, for example 伊勢ノ海 Isenoumi, 佐渡ケ嶽 Sadogatake and 六代目式守伊之助 the sixth Oyakata Shikimori Inosuke.